Tampa Bay Bats and Nuisance Wildlife Relocation is dedicated to the protection of your family's health and property. 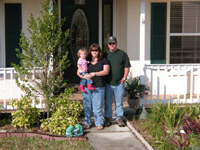 We are a family owned and operated business serving Manatee, Sarasota, Charlotte, Hillsborough, Pinellas, Polk and Lee Counties in Central Florida for more than ten years. Using the latest techniques available, we have perfected a safe, effective and humane system of trapping and relocating nuisance animals. Our goal is to provide complete satisfaction to all of our customers. We offer a full array of services. We will investigate and identify the nuisance animal. Then we will explore the options available with the customer to ensure the safe and humane removal and relocation of the animal. Once the animal has been removed and relocated, we will repair the damage it has caused. Finally, we will work with the customer to educate on prevention, to make sure the nuisance does not come back. Nuisance Wildlife Relocation is committed to providing safe, effective and humane solutions to all nuisance animal problems in private homes and commercial properties throughout West Central Florida. Manatee, Sarasota, Charlotte, Hillsborough, Pinellas, Polk, & Lee Counties: Alturas, Alva, Anna Maria, Apollo Beach, Auburndale, Babson Park, Balm, Barefoot Beach, Bartow, Bay Pines, Belleair, Belleair Beach, Belleair Bluffs, Belleair Shores, Boca Grande, Bokeelia, Bonita Springs, Braden River, Bradenton, Bradenton Beach, Bradley, Brandon, Cape Coral, Cape Coral Central, Cape Coral South, Captiva, Carrollwood, Champions Gate, Clair Mel City, Clearwater, Clearwater Beach, Cortez, Cresent Beach, Crystal Beach, Cypress Gardens, Davenport, Davis Island, Dover, Dundee, Dunedin, Durant, Eagle Lake, Eaton Park, El Jobean, Ellenton, Eloise, Englewood, Estero, Fedhaven, Florence Villa, Fort Meade, Fort Myers, Fort Myers Beach, Frostproof, Fruitville, Gibsonton, Grove City, Gulfport, Haines City, Highland City, Holmes Beach, Homeland, Indian Lake Estates, Indian Rocks Beach, Indian Shores, Kathleen, Kenneth City, Kissimmee, Lake Alfred, Lake Hamilton, Lake Wales, Lakeland, Lakeshore, Lakewood Ranch, Largo, Laurel, Lehigh Acres, Lithia, Longboat Key, Loughman, Lutz, Macdill Air Force Base, Madeira Beach, Mango, Matlacha, Matlacha Isles, Miromar Lakes, Mulberry, Murdock, Myakka City, Nalcrest, Nichols, Nokomis, North Fort Myers, North Port, North Redington Beach, Northdale, Odessa, Oldsmar, Oneco, Osprey, Ozona, Palm Harbor, Palma Ceia, Palma Sola, Palmetto, Parrish, Pass A Grille Beach, Pinecraft, Pineland, Pinellas Park, Placida, Plant City, Poinciana, Polk City, Port Charlotte, Punta Gorda, Redington Beach, Redington Shores, River Ranch, Riverview, Rotonda West, Rubonia, Ruskin, Safety Harbor, St. James City, St. Petersburg, St. Petersburg Beach, Sanibel, Sarasota, Seffner, Seminole, Siesta Key, South Pasadena, Sun City Center, Sun City, Sydney, Tallevast, Tampa Palms, Tampa, Tarpon Springs, Temple Terrance, Terra Ceia, Terra Ceia Island, Thonotosassa, Tice, Tierra Verde, Town N Country, Trailer Estates, Treasure Island, University of South Florida, University of Tampa, University Park, Valrico, Venice, Wahneta, Waverly, Westchase, Wimauma, Winter Haven, and Ybor City. Copyright 2011 © Nuisance Wildlife Relocation, Inc. All Rights Reserved.